Howdy! Sorry I've been MIA this last week. School started on Wednesday and, on Monday, I made the executive decision (with support from my husband) to full time homeschool my 7th grade son. He was scheduled to do 2 classes at his middle school this year, but the times they wanted him to take classes messed up my work schedule too much. So, I figured adding 2 more subjects didn't matter in the grand scheme of things. But, it did leave me scrambling a bit to cover my work schedule with a sitter and add a few more things for him to work on. 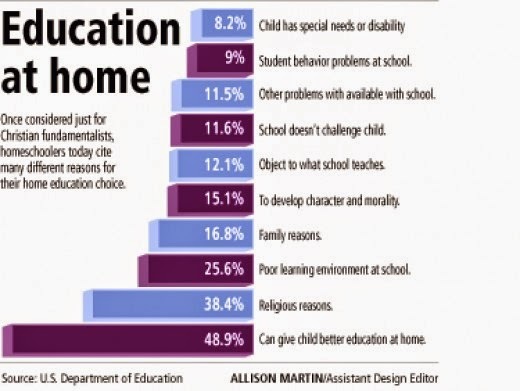 As far as our decision to homeschool our son, we meet about 8 of the reasons shown in the graphic at the right. I'm still freaking out a little bit about this decision, but I know he could step back into the part-time schedule at school if it doesn't work out. However, at this point, I don't think he's going to want to. I've spent a lot of time reading about different homeschooling techniques. Last year we basically did school at home. We followed the 6th grade curriculum for the most part. I think it was good for a transition, but ended up being relatively uninspiring and there was still a lot of struggle and resistance. I have become much more interested in the idea of unschooling, but have settled on something in between for now. More of an eclectic, student-driven homeschooling within the general guidelines of a 7th grade curriculum. In other words, I'm going to offer the material and let him spend as much time on something if he's interested and sweep quickly over things he's not interested. Plus a whole lot of other fun stuff that doesn't involve sitting at the kitchen table all day. My son's big resistance is with math, which is surprising because he's naturally extremely adept at it. I don't know what happened in public school that made him hate it so much, but we are taking it slow. I'm using the Life of Fred math books and I've already determined that he's going to need a lot of review work. I, frankly, don't think he did any work in 6th grade math at school last year, so we have a bit of catch up to do. But, that said, I want it to be a positive experience. It's also a huge lesson for me to give up the fear and control of having to do "such and such work in x amount of time". So far, the first couple of days have gone well. I think I've got things organized enough at this point that it will get easier as we go along. And, with more of a gradual focus on unschooling, it should get easier altogether. Most importantly, he seems to be much more relaxed and happy about school. And, for once, I don't have to worry about issues at school for the first time in 8 years, which is a huge relief. You know, I'm a really big fan of standards and benchmarks. I don't know your son, but what would he do if you told him that he needed to prove he could master a list of the standards by the end of the week, or cycle, or year? In any way he can demonstrate it. It puts the creative emphasis on the student while showing them that there is a criteria for what must be learned. It also allows a student to master what they need to know and then use some time for projects at are more interesting to them. For instance, you must devote x many of hours of time to bettering your mind each week, of those hours Y must be spent on reaching standards until the standards are met, after which those hours can be used for mind benefiting interests of your choice. Just a thought as you proceed. Good luck! As a teacher myself, I applaud you. I teach to the LOWER level of my class, otherwise those kids would just sit like a bunch of rocks. Well, they do that anyway...sigh...the common core curriculum is VERY difficult for most kids. Make sure he does a lot of writing. That seems to be the one area that colleges and corporations want. I know...my husband hires and fires people in his department!